Munich researchers have developed a novel method that allows them to predict the clinical course of glioblastomas, using as biomarkers short fragments of RNA called miRNAs. Glioblastomas account for about 20% of all brain malignancies and are the most common type of brain tumor found in humans. These tumors are also highly aggressive and are therefore difficult to treat effectively. Molecular markers could help to classify such tumors into clinical subtypes and facilitate the selection of the most appropriate therapy for each case. Research teams led by Professor Claus Belka, Director of the Clinic of Radiation Therapy and Radio-Oncology at the LMU Medical Center, and Dr. Kristian Unger, Deputy Head of the Department of Radiation Cytogenetics (Director: Professor Horst Zitzelsberger) at the Helmholtz Zentrum München, have now identified specific “microRNAs” (miRNAs) that could serve as biomarkers with which to track the course of the disease. miRNA molecules are short RNA sequences that play a variety of roles in the regulation of gene expression. The results of the new study appear in the journal Oncotarget. In collaboration with clinicians at the Institute of Neurology (Edinger Institute) at Frankfurt University Hospital, the Munich researchers examined the composition of miRNAs in tumor samples obtained from 36 patients during the course of treatment, and whose subsequent therapeutic regime and clinical progress had been well documented. “We repeatedly detected four miRNAs in tumors that had a particularly poor prognosis,” explains PD Dr. Karim-Maximilian Niyazi, senior physician at Grosshadern, and first author of the study. Based on their data, the scientists were able to calculate a risk score that distinguished two groups of patients who were undergoing standard treatment and whose life expectancy differed by about five months. In order to corroborate their findings, they used data obtained from a further 58 independent samples. Here, too, their analyses revealed that specific differences in the composition of the tumor miRNAs correlated with the probability of a successful treatment outcome. The scientists are confident that their observations will have more than mere theoretical implications. For this reason, they have already filed an application for the corresponding patent. 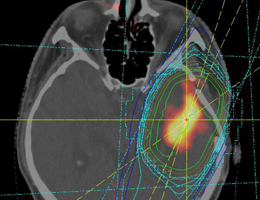 “To date only few prognostic and predictive factors for glioblastoma have been identified,” says team leader Unger. “Our method could be used to identify candidates for alternative or intensified treatment options, as it is highly unlikely that patients with a high risk score would benefit from standard therapy.” Since tumor tissue is generally removed immediately, a corresponding analysis would be relatively easy to conduct and would not require any additional time or expense, the researchers note.